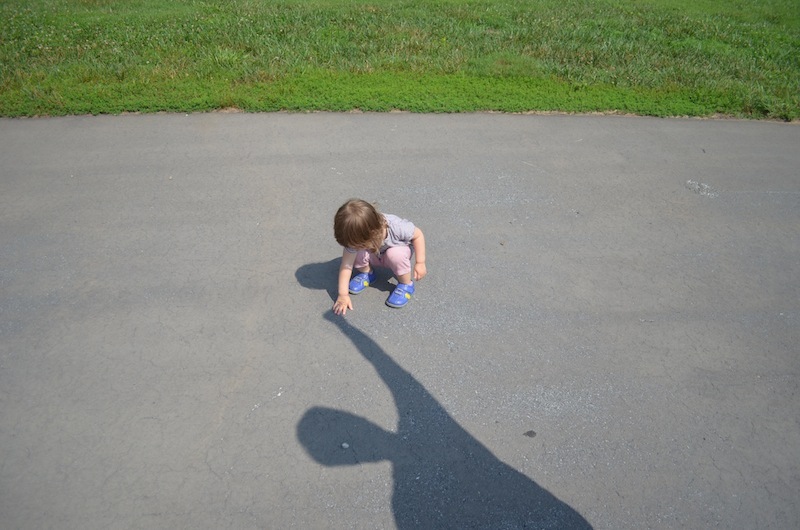 We recently took a trip to Asheville and one of the things that Kai discovered on her trip was her shadow. She likes to say hi to her shadow and try to hold its hand. When she does get her shadow’s hand, she is slightly mystified when she starts walking and the shadow escapes her grasp. What’s going on? Why won’t you hold my hand? I find it really fascinating to watch Kai notice things and try to figure out how things work and what their place in the world is. I used to watch Mrs Bean watch and react to things and now I watch our daughter. Kai hasn’t watched TV at home, but when I started taking her to the kids club at the gym, she’d be really upset. One of the staff there found that if she let Kai watch Elmo or Dora for a few minutes, she’d calm down and then go off and play. Now…she gets extremely excited when she sees Elmo – we ended up buying that packet of fruit smoothie packet for toddlers when she caught sight of one when we were strolling down the aisle. She also gets excited by Elmo lookalikes (Grover). Sigh. While it’s nice to know she can recognize characters and say their names, it’s a little freaky to see how easily our kid (or any kid, I guess) can get sucked into the branding/marketing game…with all the marketing out in our daily lives, I wonder if this will be a challenge in the future or it’ll just be something we take note of.